between stretches of rocky cliffs. In 2004, while walking down one of the sandy paths winding down through the pine trees and vineyards to the sea, we came across an old stone ruin dating from the early19 th century. Entranced by the unspoilt beauty of the setting and the proximity to the coast, we undertook 12 years of negotiation, purchase, design and construction, to transform the ruin into a home designed with the summer in mind. From the path, the houses do not look very different than they did on that day, with their strong walls built of large, irregular granite blocks. But concealed behind these walls are two houses that seamlessly blend the historic with contemporary elements of chestnut wood and rusty Corten steel. The houses are isolated, surrounded by vineyards, far from any roads. An 800m walk through pine groves and dunes lead to Barra beach, a magnificent beach in a stunning natural setting, and further on to Melide Beach facing the Atlantic. From the house, you can walk right out onto hiking trails taking you around the Cabo do Home rocky peninsula and other areas of outstanding beauty. 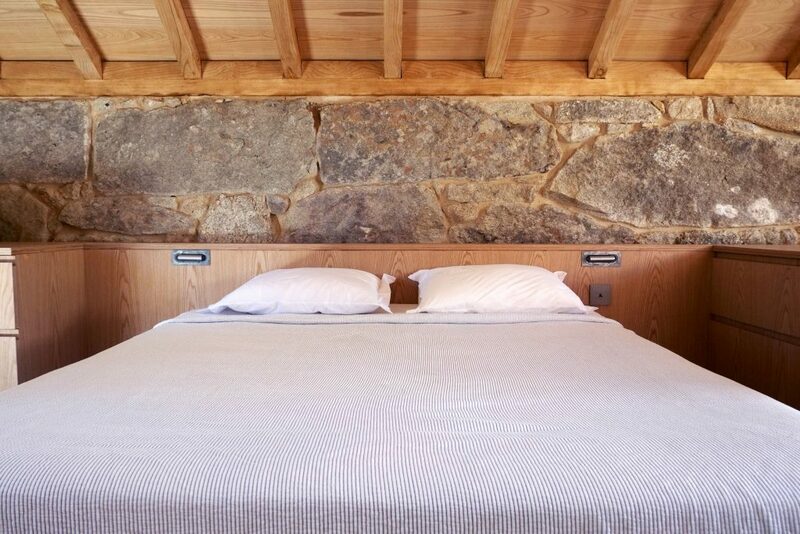 The main house sleeps eight in four bedrooms and the Cabaña four in two rooms. They can be rented together or separately. There is no problem of overlooking from one house to the other. We love being here because of the nature all around, the tranquillity, the seafood, the sound of the sea at night and most of all the authenticity of the local people. When people come stay at the house, the most common comment is that it is a little corner of paradise. We want to share this corner of paradise with other people who appreciate contemporary design and a remote location far from the bustle of modern life.